In 2001, the adoption of the European Company Statute was based on a unanimous political compromise according to which EU company law should not jeopardise but should safeguard existing national rights of employee participation at board level. Although these rights have since then undergone changes in most of the 17 Member States where they exist, employee representation in the boardroom, including the right to vote, remains a widespread phenomenon throughout Europe. However, loopholes in the current EU legislation and the emergence of an EU legal approach promoting regulatory competition are putting these rights under pressure. 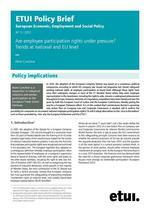 This Policy Brief is both a summary and an updated version of a more extensive ETUI report published in November 2011.